90k Photograph of a general arrangement drawing of a US Navy torpedo boat and its spar torpedo. The original plan appears to be of 19th Century vintage and is drawn on cloth. LT. William B. Cushing used US Navy Picket Boat Number One to sink the Confederate ironclad ram CSS Albemarle on the night of 27-28 October 1864. 98k General arrangement of a Screw Picket Boat constructed for the Navy Department. The was plan published in "Submarine Warfare, Offensive and Defensive", by LCDR. J.S. 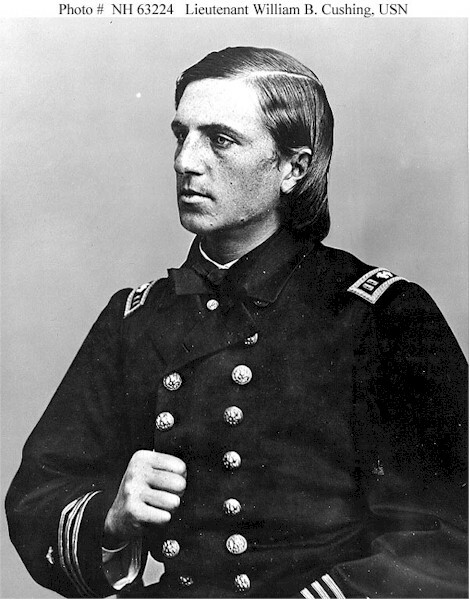 Barnes, USN, 1869. The drawing also includes detail drawings of the spar torpedo carried by this boat. 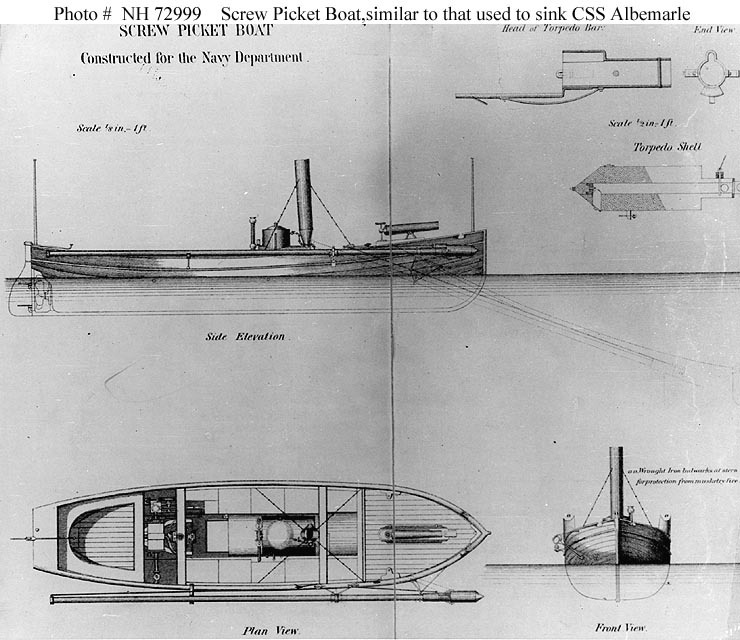 This craft is similar to Picket Boat Number One, which was used by LT. William B. Cushing to sink the Confederate ironclad CSS Albemarle on the night of 27-28 October 1864. 85k Engraved reproduction of a wash drawing by R.G. Skerrett, 1900, of Picket Boat Number One. 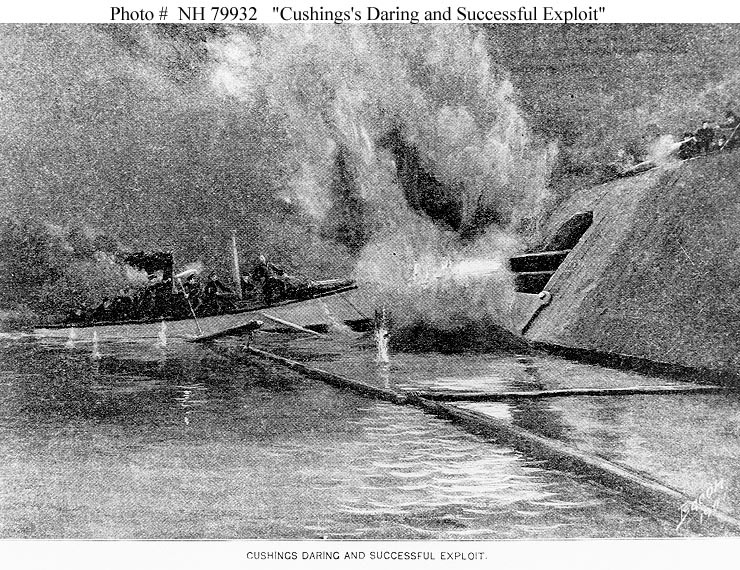 This craft, armed as a spar-torpedo launch, was used by LT. William B. Cushing to sink the Confederate ironclad ram CSS Albemarle on the night of 27-28 October 1864. 202k Artwork by Bacon, published in "Deeds of Valor", Volume II, page 74, by the Perrien-Keydel Company, Detroit, 1907. 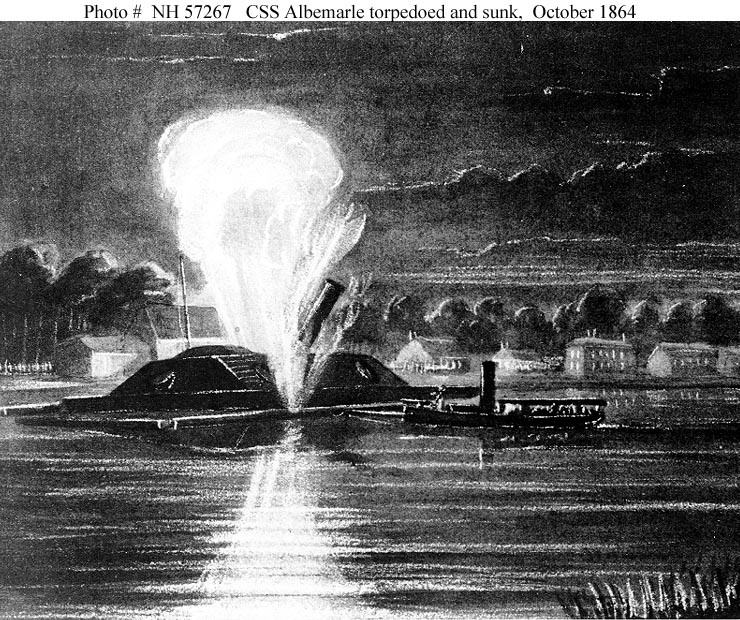 It depicts the attack on CSS Albemarle by a torpedo launch commanded by LT.William B. Cushing, USN, at Plymouth, North Carolina, 27 October 1864. The torpedo boat, Picket Boat Number One, is shown crashing over Albemarle's protective log boom to deliver its torpedo against the ironclad's hull. 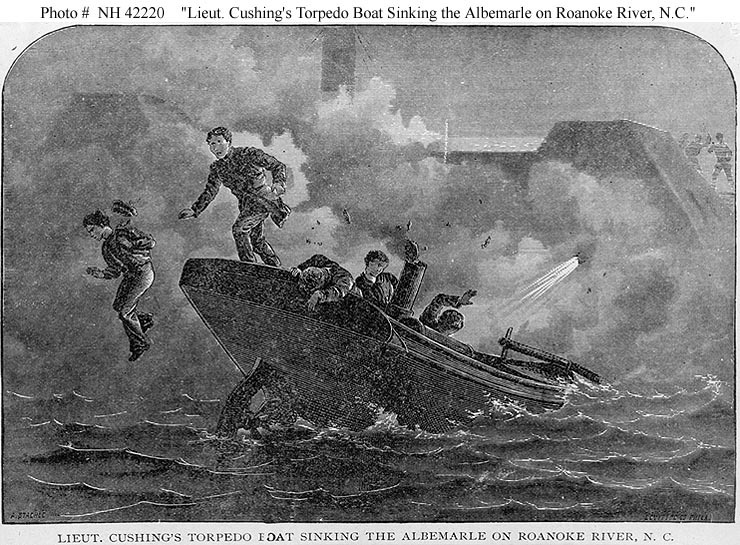 CSS Albemarle torpedoed and sunk by LT. William B. Cushing in Picket Boat Number One at Plymouth, N. C., 27 October 1864. Phototype published by F. Gutekunst, Philadelphia, Pennsylvania, circa the later 19th Century. Print from the Skerrett Collection, Bethlehem Steel Company Archives. Engraving by A. Stachic, published in "Naval Battles of America", by E. Shippen. Depicting the successful spar torpedo attack by LT. William B. Cushing and his crew on the Confederate ironclad CSS Albemarle, at Plymouth, North Carolina, 27 October 1864.